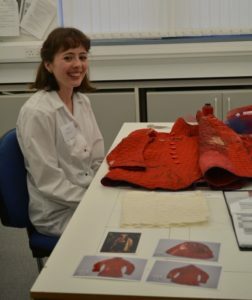 We are very fortunate to be supported by three different institutions which each award an annual prize to recognise the achievements of one of the Textile Conservation students. 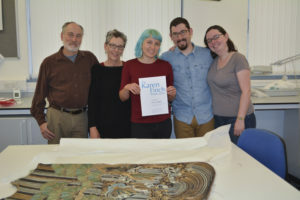 Keira Miller received an award at the end of the first year of the programme from the Weavers’ Society of Anderston, one of the organisations associated with The Trades House of Glasgow. Keira was presented with a Certificate of Excellence at the Weavers’ Society’s annual lunch held on 9 September. Nora Frankel, a second year student, has been awarded the Karen Finch Prize 2016. This prize was established a year ago, to mark the 40th anniversary of the founding of the Textile Conservation Centre in 1975 by Karen Finch OBE, and Karen’s role in developing education in the field of textile conservation. It was very fortunate that some of Nora’s family from the USA were able to witness the presentation of the certificate. Hannah Vickers has been nominated to receive the Worshipful Company of Woolmen’s Silver Medal; she will be presented with the medal at a dinner in London in November. 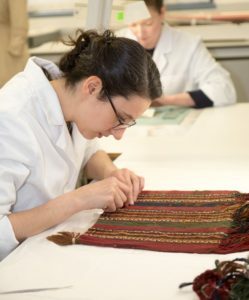 Hannah joins a group of graduates from the Textile Conservation Centre and, more recently, the Centre for Textile Conservation who have been awarded this honour. We are really grateful to these institutions for acknowledging the exceptional work of our students in this way, and would like to congratulate this year’s prize recipients.